I love this time of year when the air gets cooler and the leaves change color. Occasionally, cold fronts come through with a little moisture, and hopefully, not much wind. That was the case for this photo from the San Francisco Peaks, near Flagstaff, Arizona taken a couple years ago. When people think of autumn color, they usually think of places like the northeastern US or Smoky Mountains. Here in the southwest, we get our seasonal change in patches, rather than sprawling hillsides. That usually means canyons, and one of the best displays for autumn is Zion National Park, Utah. 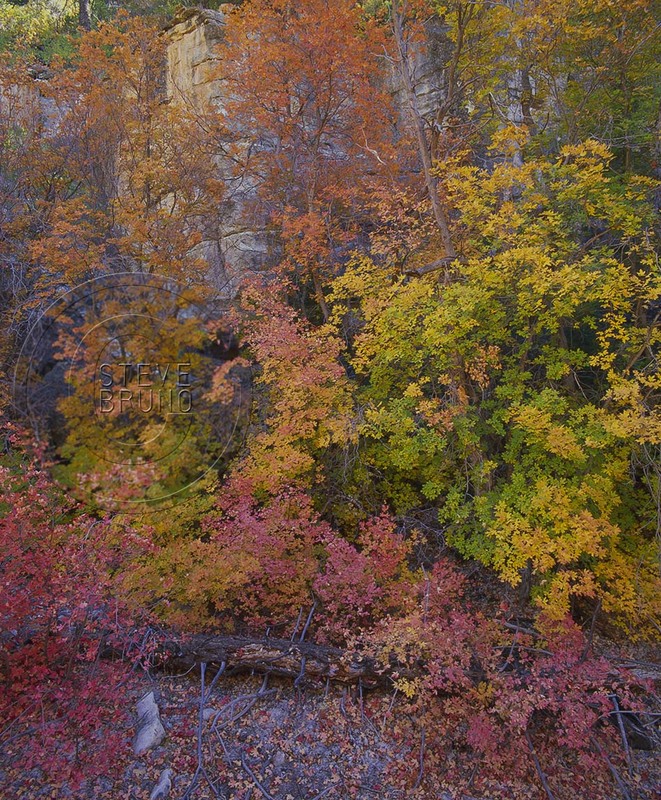 Perhaps it’s the tall canyon walls protecting the trees from the winds that could drop the leaves before the colors peak, but conditions are very favorable here for a great autumn display. And just because the scene is alive with color, it doesn’t mean you need to be capturing it that way. The original for this was captured on Kodak Pan-X 4×5 film. This is my addition to Leanne Cole’s Monochrome Madness this week. Photos from others as well as instructions to join in can be found on her website. The first hints of pleasant temperatures have made it to the desert southwest, and before September 21st. I’m sure that’s a mistake, but we’ll take it! Autumn is a lot more reliable in the high country. In those years where there aren’t any storm fronts and their associated winds, some forests can take on pretty spectacular colors. The aspen trees are in the highest life zones, and the first to change color. That’s usually a brilliant gold, but sometimes they can linger to deep oranges and reds. This particular stand of aspens, mixed with the pines, is from the Kaibab National Forest, north of the Grand Canyon. Although a major fire has devastated a large portion of that forest, it is still one great place to view the seasonal change. The contrast of the brilliant aspens to the other trees, along with a very clear sky makes for nice full days of hiking and photography. This is my addition to Leanne Cole’s Monochrome Madness this week. You can check out her website here. Returning to the 21st ave bus route. Previously along the journey, our lady with the red and orange hat boarded at the September Street stop. She’s always so full of contagious energy when she gets on. That’s probably why she is so well liked, especially by the children. Her colorful stories, many regarding the holidays, keep the young ones entertained. They asked her name one time, and a couple of them got it wrong. Her nickname, the mispronunciation, Aunt Em, has stuck. For as much energy as she exudes, Aunt Em has mood swings that bring her crashing down. I used to think she was bipolar, but then I figured out it runs deeper than that. Her Old Man has a dominant grip over her. There’s been a few times when he jumps on a couple stops early, and proceeds to howl and scream at her to get off. Occasionally she caves in and leaves, but most of the time she holds her ground. There’s more fortitude in that woman than the first impression might indicate, but wow, what a dysfunctional family! We’ve reached her stop, December Drive, and Aunt Em is almost as pleasant as when she got on. Many people complimented her on her attire this time around, and I guess that’s helped her attitude. Additionally, there’s been no sign of her Old Man. I see him standing on the corner, however. While going through my files, I came across this shot, which I thought fit the challenge very well. This was taken in Kaibab National Forest, Arizona.